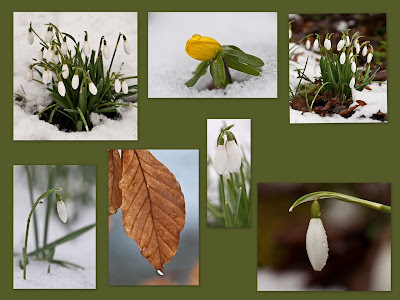 This is a collage of snowdrops, a drippy leaf and winter aconites seen at Hopton Hall here recently, made more interesting because there was still snow on the ground. Well worth a visit. N.B. photographers please take something warm and waterproof to lie on, as it gets very cold down the whole of the front of your body. I came back with wet knees and muddy elbows, as my plastic sheet wasn't quite long enough. Yesterday evening Thursday 27th March 2010 ten of us went to Simon Mackney's studio here to take photographs of our model for the evening Katerina who originates from the Czech republic, we all had an opportunity to take photographs under the direction of Simon who also set up the lights and the wind machine. Simon is the guy standing in the photograph lower left. Snow photographs from around our village on Sunday 21st February 2010. By the time I went out on my walk at approximately 8:10am the thaw had started and the trees had shed most of their covering of snow. 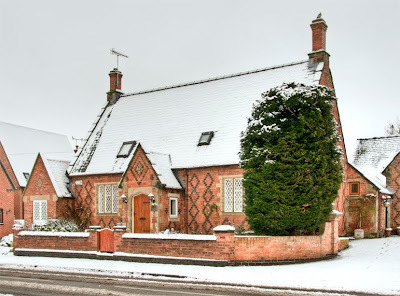 This is a High Dynamic Range Image (HDRI) of the Old School House in Aston on Trent, covered in a mantle of snow. Dull sky I am afraid this is as it was, no colour. 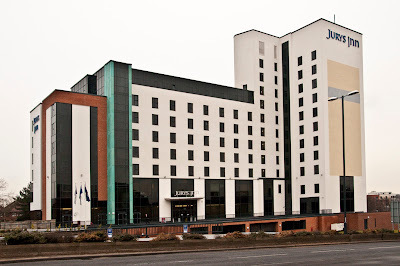 So here we are in the Highcross Leicester, click here, it used to be called the Shires for those persons who have not been to Leicester for a while. Neglected to pick up D-SLR cam on the way out to the car so I was, this time, only equipped with my hi-tech carry about all singing all dancing phone. We have in this collage top left interesting shapes, colours and forms in the Triumph shop, middle top interesting discs, rather like CDs and DVDs which change colour depending where you are situated in the mall and the light being reflected from them. Bottom left a view looking towards the entrance to the John Lewis store interesting shapes in the structure and the etched designs in the glass panels. 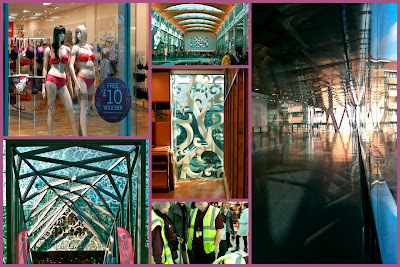 Middle image is a view of the etched glass from within the John Lewis store. The image at the right is looking along the first floor to the right of the JL store. The middle bottom image is of the three security/cleaning contingent that stood adjacent to me. 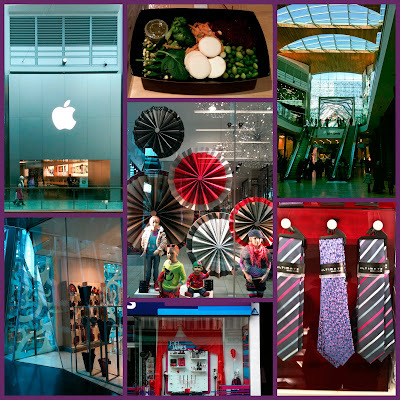 This montage is another selection of images from Highcross. I am very amused with the striking colours and shapes that I was able to experience and capture. The middle bottom image was taken in Gallowtree Gate. I spent over an hour with a specialist trainer in the Apple store, top left image. I thought I was up to speed on using their phone. My eyes were opened to a lot more to what can be achieved with it. Middle top is my lunch eaten at "EAT Ltd" which consisted of shredded beetroot, peas, broccoli, muki beans, goat's cheese, sweet potato, spinach, mung beans, sunflower oil, Chardonnay vinegar, honey, sunflower seeds, pumpkin kernels, pine kernels, lemon juice, brown sugar and black pepper. All in all a healthy dish followed with a bluberry topped yoghurt. So, yesterday S, A and E were visiting, why you may ask. E's school teacher had set him a half term project. 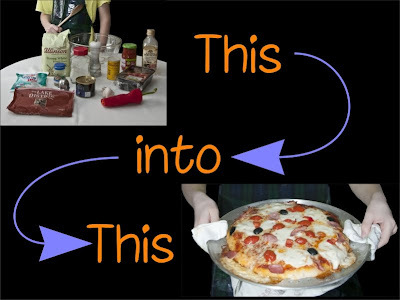 Make a genuine Pizza. E suggested to me last week that since the ingredients were not available then, we could go to the supermarket, buy a pizza, I photograph him with it and he would tell his teacher that I couldn't take any photographs of him making it. I said to him that it would not be entirely honest to carry out his idea. So yesterday all of the ingredients were assembled and during the course of the morning as you can see a pizza was made. The result was absolutely scrummie S and A thought so too. So, I am out on my walk merrily powering along at my top speed of 4 miles per hour with my brain re-charger plugged in, listening to The Nitty Gritty Dirt Band. When on Weston Road in Aston on Trent I espy an elderly lady a little way in the distance. Incidentally this is the same lady who stopped me on Monday and said to me that there were no school children about that day, I explained that they were probably still in bed as it was the start of the half term holiday. I digress!! She had one of those old style shopping bags over her left arm and she was reaching into the bag. She brought out the pack of tomatoes, shown in the photograph above and asked me if I would like them as she wasn't going to eat them and would probably end up throwing them away. How very kind and generous. 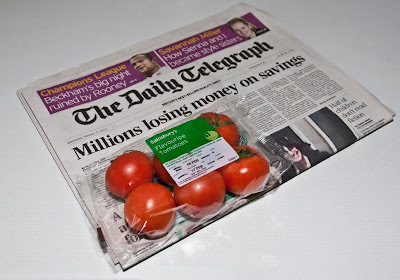 Then when I arrived back at the buildings the newspaper headlines was headlining about millions of us losing money on savings. My thoughts went back to the kind elderly lady and wondered if she was concerned about her savings, if she has any. Matt's cartoon in the Daily Telegraph made me smile today too, click here. Thus is a collage of the Derbyshire Snow Scenes that I entered in the Derby City Photographic Club competition on Monday 15th February 2010. The judge commented that he felt that there needed to be a little more detail in the snow areas of the images. He wasn't too pleased with the image top right, he felt it needed the horizon to be lower and then it might have fitted the panel layout better. 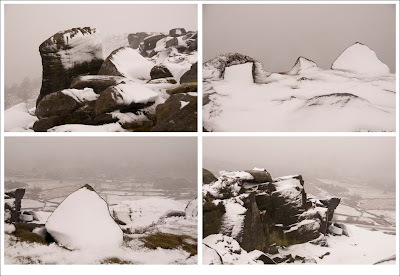 The original photographs were taken from Curbar Edge in the Derbyshire Peak district, on the morning of Wednesday 30th December 2009 at approximately 9:45am. Having sat in the car waiting to see a sunrise for what seemed hours, a sunrise wasn't seen because of the blizzard conditions. The only thing that was evident was the whooshing noise of the ice particles hitting the drivers' side windows and it building up in interesting patterns on the glass. Had to bite the bullet eventually and with hood up, gloves on and camera stuffed inside my Berghaus coat wandered on to the edge, the ice particles were blowing horizontally and stung any exposed skin. 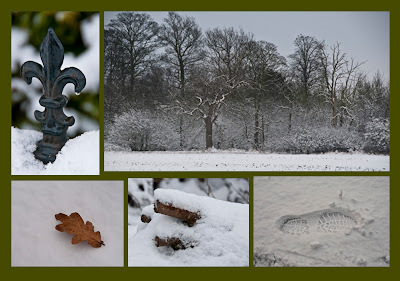 A collage of a few photographs that I took when in Birmingham on Saturday 13th February. Bottom right, a mid afternoon snack of raspberry cheesecake and a large hot chocolate in Debenhams. Middle left, what I was given to believe was Rackhams, not any more, it is now House of Fraser. Showing a display of Valentines day gifts. Top centre, entrance to the Bullring Centre from New Street Station. Left bottom, is an external shot of Selfridges store front with the amazing disc patterns. 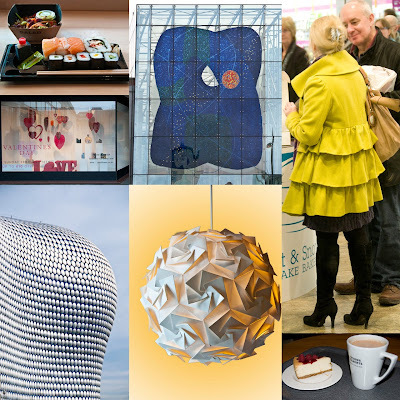 Top right is a stylishly dressed middle aged lady and companion buying Valentine cupcakes in the Bullring centre, recovered this image after the store security made me delete the photographs that I had taken inside the shopping mall. Bottom middle, an intriguing lampshade which was above my head when consuming my Sushi lunch, top left in the collage. 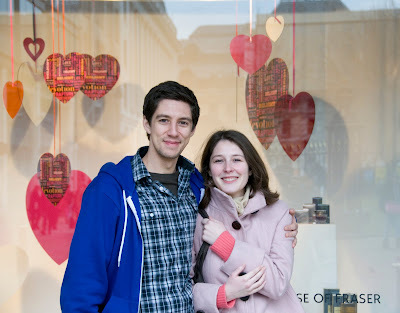 And this delightful young couple, with love and happiness in their eyes popped in front of my camera and without me asking, posed for this photograph. 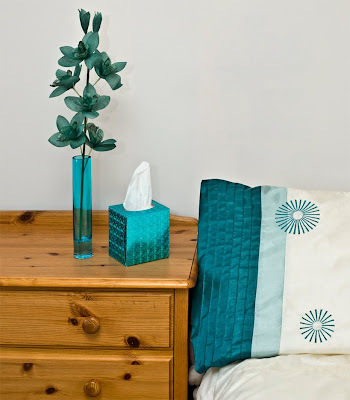 The new colour scheme in the second bedroom which has recently been decorated and a few coordinating bits and pieces put in there for guests to enjoy. 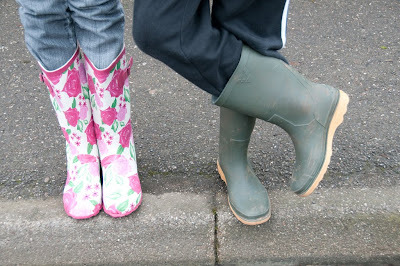 As the Nancy Sinatra song goes "These Boots Were Meant For Walking" Here. So these guys took me for a walk in Long Walk Wood they really enjoyed the play in the woods. Imaginary commando's at work, shooting all and sundry with their twig guns. Then we returned along by the canal to return home for refreshing drinks and dinner. Our city is being peppered with modern architecture, this edifice replaced a motor dealership which previously occupied this site. It overlooks many other buildings because of it's elevation, some of those buildings are old like the adjacent church and some of them are modern, as are those are across the inner ring road which runs in front of it, seen in this photograph. Spectacular views are to be had depending on the weather conditions and on which side of the building one is looking from. Rooms on this side look towards the south, past the church of St Michael, now reused as an architects offices, past the Cathedral across the Market Place and beyond. 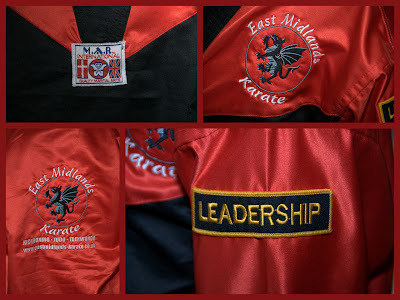 These are some of the emblems worn by Karate Kid E. He has invaded my workspace for a couple of days and he is making great progress in his training, he now has his yellow and white belt. His most liked activity at the club is "Learning New Moves" some of the moves are hard to learn, however he is trying very hard.